Yes, that’s a mouthful, but it’s a really good one … believe me! 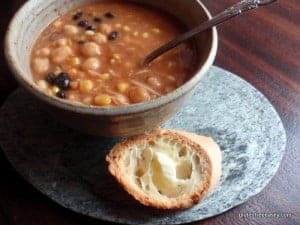 I hesitated over sharing this Spicy Sweet Potato, Cabbage, Bean, and Vegetable Soup because the original version was not totally made from scratch as most of my soups are. The first time around I made this soup using Bloody Mary mix actually. I always buy Bloody Mary mix for our Valentine’s Day parties. Some years it gets consumed. Some years not. This year the Bloody Mary mix didn’t even get opened. I knew that I wasn’t going to put it back in my liquor cabinet (aka the top shelf of my pantry) because it would not get used if I did that either. We don’t have many Bloody Mary drinking friends who stop by. Although pre-made Bloody Mary mix can be some fairly horrific stuff … full of high fructose corn syrup and lots of undesirable ingredients as lots of drink mixers (but not all) are, the mix I found was one of the the healthier ones. It was free of gluten (of course), HFCS, and MSG, but it did contain some ingredients at the end of the listing (therefore, in lesser amounts) that are not ones I normally consume (e.g., soy). From the ingredients listing, the Worcestershire sauce included in this Bloody Mary mix even appeared to be vegan, which is a bonus for my vegan friends. So I decided I’d used this Bloody Mary mix in some soups because I’ve been on a real soup kick of late. Although Mr. GFE doesn’t care to eat soup night after night, particularly the same soup night after night, but when I come up with a good soup, I’m more than happy to eat it several times in a row. Even for several meals in a row. I will eat great soup for breakfast, lunch, and dinner. This soup is great soup. Every time I eat a spoonful, I am thrilled with the combination of flavors and textures. It’s perfect for a Meatless Monday and other than the Bloody Mary mix, all the ingredients come from your basic pantry—broth, sweet potatoes, finely shredded cabbage (these become very much like noodles), shredded carrots, black beans, chickpeas (you know how I love them! ), corn, and coconut milk (or other non-dairy milk). I had hoped to come up with homemade version of Bloody Mary mix that I could just include in the ingredients, but for now, I’m just going to share this version and let you guys run with it. A quick and easy substitution for Bloody Mary mix is a spicy tomato juice or regular tomato juice or even V-8. If you want to substitute ingredients from your pantry for the Bloody Mary Mix, I’m thinking that diced tomatoes, carrots, celery, onions, garlic, lime juice, horseradish, celery seeds (or celery salt), and some molasses and pure hot sauce might be a good start. If I ever make my own version from scratch, I’ll come back and share, of course. But here is the super simple recipe as it stands today. This soup is full of flavor and textures, and it's delightful! Shredded cabbage gives this soup a little crunch and even a bit of a noodle vibe without actual pasta. Combine all ingredients in large stockpot. Bring to a boil on stove top. If you want to substitute ingredients from your pantry for the Bloody Mary Mix, I think that diced tomatoes, carrots, celery, onions, garlic, lime juice, horseradish, celery seeds (and/or celery salt), molasses, and hot sauce would be a good start. You can even add some gluten-free Worcestershire sauce if you find one that meets your needs (e.g., vegan). You could also use a spicy vegetable juice (ready-made or homemade) in combination with diced or pureed tomatoes in place of the Bloody Mary mix for a soup with less complex flavors. I’d definitely recommend the use of an immersion blender near the end of your cooking time if you are adding diced or larger pieces of tomatoes. The finely shredded cabbage in this recipe creates a nice crunchy “noodle” effect. Shirley – this soup sounds wonderful! I love soups too – and easily could eat soup for breakfast, lunch or dinner! Cabbage is fantastic in soups – not only tasty but hearty as well. So smart Shirley! And classic Gluten-Free Easily 🙂 I always wanted to like Bloody Mary’s, but I just couldn’t do it! In a soup though, yes I think so! Maggie–Aww, thanks, dear! I do live my gfe approach. 😉 I’ve never enjoyed Bloody Mary’s either, but combined with sweet potatoes, cabbage, etc., the flavors are perfection. I’ve been missing this soup! Ohhhhh yum!! What beautiful pictures, Shirley! This is a must for me as Mr. Spinner and I love a good Bloody Mary , so the soup is sure to be a hit. I am such a soup girl! Love this recipe. Pinning to make VERY soon. What an interesting mix indeed Shirley! I love soup too- yummo! This sounds really yummy, Shirley! And I like that you used bloody mary mix. I bet it really adds to the flavor! This sounds so interesting – not to mention warm and inviting. I can’t wait to give it a try. My next search might just be for a homemade Bloody Mary mix – because I love to mix things up in the kitchen! Thanks for sharing the recipe! My son loves this soup. Keep up the good work! 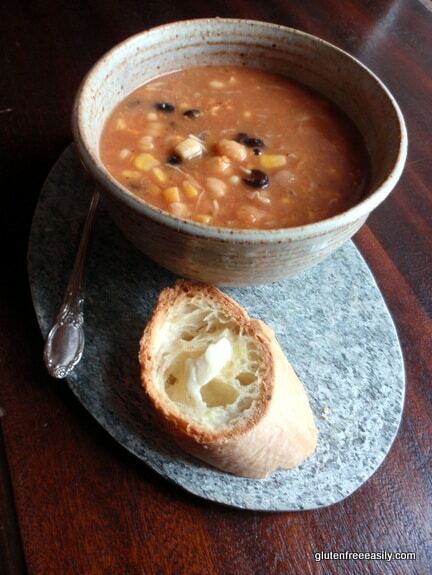 This soup really looks hearty and delicious. I probably would use the V-8 juice and I love your comment about the cabbage becoming almost like noodles. I can’t wait to try this soup,. Thanks for sharing it. 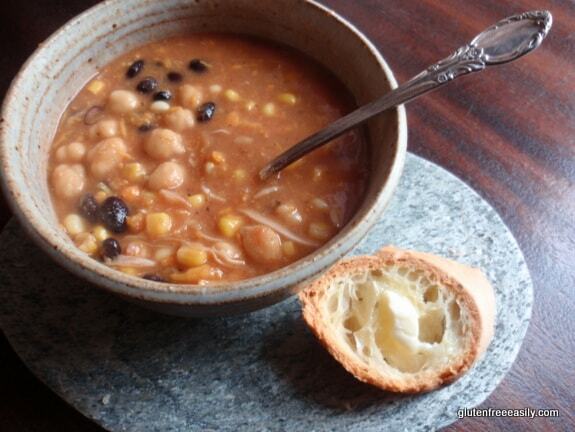 Hi Judee–This soup was such a pleasant surprise when I first made it and I still love it. The Bloody Mary Mix is a bit thicker than V-8 or tomato juice, but you can get the same thickness in this soup by using your immersion blender in the pot for about half a minute. Hope you enjoy it!